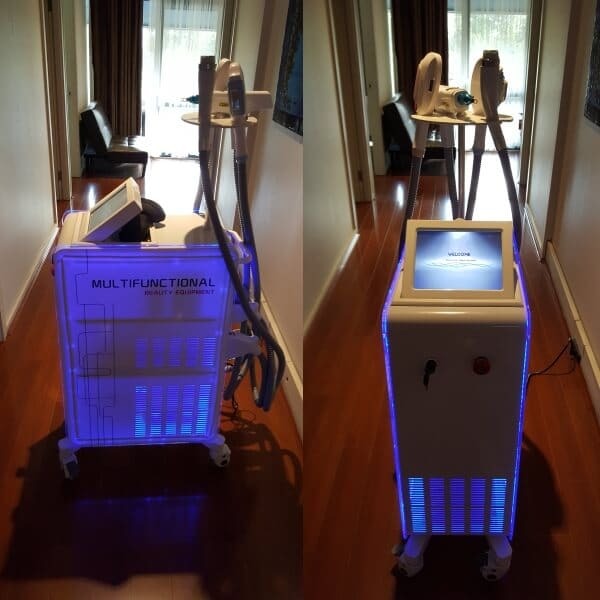 E-light SHR laser hair removal RF ultrasound on the North Shore of Sydney. In keeping with our vision of providing the best in skincare and beauty we have purchased a new 4 in 1 SHR IPL hair removal, E-light pigmentation, rejuvenation and red vein removal, YAG laser tattoo removal, pigmentation, red vein removal and rejuvenation, and RF ultrasound skin tightening and fat cavitation machine. Yes, all those treatments in one machine. I here you ask does having all those treatments in the one machine mean any of the 4 in one heads less effective? The short answer is no. What it means for us is we save money by four treatments being in the same machine, they share the water cooling, case, screen etc. It also means it takes up less space, which is important to us. We already have a room packed with equipment. What it means for you the best in skincare and beauty treatments and that is important to us. We have one head that is just for SHR hair removal. That means we don’t have to swap filters to remove hair or do other treatments. The SHR means the IPL light is flashed, which means we keep the head moving and removing hair. With traditional IPL, it’s place, shoot, move, place, shoot, move etc, you get the picture. With SHR we keep the head moving, which means a faster, more effective treatment for you. The SHR hair removal will also treat type 5 and 6 skin types, that means darker skinned people. We have one head that is for all other treatments that IPL could do. That is pigmentation removal, red vein removal and rejuvenation. E-light is a combination of IPL and RF ultrasound. The e-light head also flashes like the SHR heads. That means instead of the flash, move flash of traditional IPL, the light keeps flashing. Which means faster and better treatment for you. Because this head is not for hair removal it doesn’t need filters. One head is a YAG laser for tattoo removal, pigmentation removal, red vein removal and rejuvenation such as our exclusive black doll gold mask treatment. What does this mean for you? not so much as our existing YAG laser does the same thing. For us it means less space. The RF ultrasound head is used for skin tightening and fat cavitation. Fat cavitation is RF ultrasound fat removal. What does this mean for you, not much as our existing RF ultrasound is great and still stat of the art. To us it’s just handy to have it on the machine. We are here delivering the best and most effective treatments here for you. What next? I hear you ask. We will be getting a new fat freezing machine and the next few weeks. Why? Because this one can do four areas instead of two for the existing machine. It also has a under the chin head What does this mean for you? Under the chin treatments and more than two treatments at the same time Saving you time. Doesn’t the blue light look good? The SHR lase hair removal sounds good, I will come and see you. My clinic has a 100 year old machine and the results are not good. It is, we use it all the time with great results. Great post\Nice post, i like it a lot.I was really lucky to discover your site. There is so much helpful info! I’ve discovered quite a lot of helpful information on your website this page in particular. Many thanks for posting.